There had been some speculation that Season 8 might start later in October to allow spinoff show Fear the Walking Dead time to finish its run. However, the earlier date implies that Fear the Walking Dead will conclude with a double episode the week before. The Walking Dead will feature heavily at San Diego Comic-Con this weekend, with a cast and crew panel taking place on Friday. A trailer for the new season is also expected to screen at SDCC. The production of Season 8 has been marked by tragedy, following the accidental death of stuntman John Bernecker last week. Bernecker suffered a fatal head injury after he fell 20 feet onto a concrete floor while rehearsing a fight scene. Filming was halted for several days but resumed earlier this week. 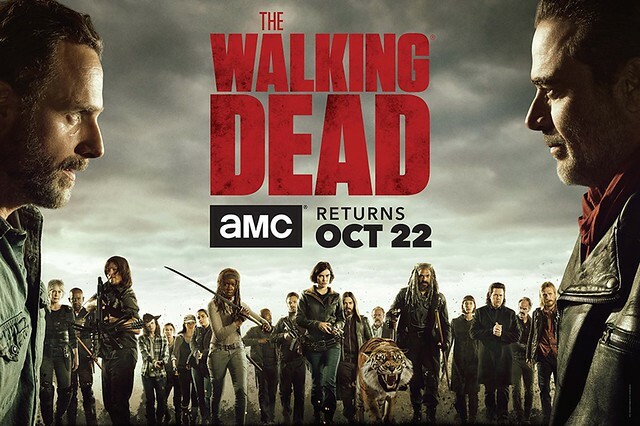 In April, showrunner Scott Gimple explained that the new season will move at a much faster pace than the more character-driven Season 7, as the show's heroes prepare for war with the villainous Negan. "The narrative has turned into one of pretty intense conflict," he said, "[And] it's going to affect the structure in ways that make it a bit more kinetic, a bit more breakneck--shifting away from entire stories in one episode, and sort of fractured over several episodes, with little pieces of each story coming together." Should have ended five or six seasons ago. The title now refers to the actors and the plot, lol. I checked out of this show at least 3 seasons ago. The ratings have been falling in the last couple years and "fracturing stories over several episodes" is not how you win back viewers. If I still had any interest I'd wait until the end of the season and download them all at once.